Useful tips for surviving in Raft. When beginning a new save on raft, you are greeted with two things, an expansive ocean, and three bars in the bottom left of your screen. For now, we will focus on the bars. There is a health bar, a food bar, and a hydration bar. They are all simple to understand. One measures your hunger, one measures your hydration, and the other your health. Also, if you happen to go underwater, a fourth bar will appear at the top of your screen denoting your oxygen left. Movement is the typical layout, aswd for directional control, space for jump, I for inventory (tab also works and as it is closer to the right hand it's generally easier to use it). Strangely for a first person game, there is no crouching. If you need any other controls found, find the whole control layout in settings. When you spawn you are spawned on a small section of wood. For now, stay on there, and don't go for a swim, for two reasons. The first, your raft will float away, and you'll spend time chasing after it. The second, and more obvious, is the large shark circling your raft. You can ignore him for a little while, however if you do not hurry he will start eating your raft. For now, just collect the floating resources with E.
You have several main priorities when beginning a save, and this section will run you through them. If you've been collecting the materials that are floating by, you should have enough resources to craft a hammer which will allow you to build. Open your inventory with I (or tab) and find it under the tools section. Craft it, and you're one step closer to the floating wood shack you've always dreamed of. Wood and water are two factors which will determine if you survive. You can get food in two ways, growing it, and fishing. I will discuss both. To begin growing your own food, you need to craft a planter. Currently, you can only craft a small one. Craft it and place it, and keep an eye out on your inventory each time you collect a barrel. You might get a potato, or a beet. You can plant these two plants in the small planter, and like all plants, they need fresh water (see below). Give the watered plants time, and stay near them, as seagulls will try and eat them. You will get more plants back than you planted, making this a renewable source of food, albeit time consuming. You can craft a fishing rod here, which is an incredibly useful item to have. It allows you to cast your rod and catch fish when prompted. However, eating these raw fish is inefficient, and you can improve their hunger satisfaction by cooking them. To do so, you need to craft a grill. That is straightforward, and once you have it crafted you can place your fish upon it. However, you can't cook something with the power of sheer willpower alone, you need some fire. Placing planks upon the grill will allow it to cook. Give it time, and your fish will be cooked. Start by crafting a cup, and a purification station. 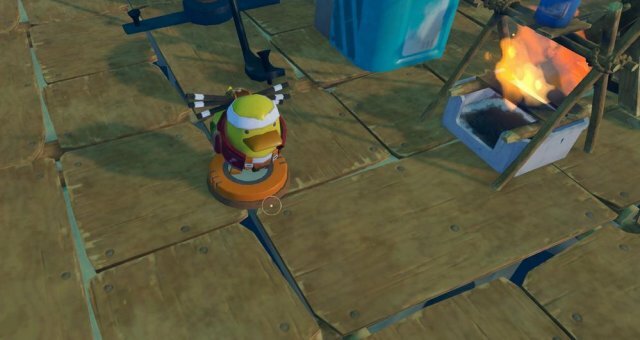 You can collect saltwater from the ocean whilst holding the cup, and place it on the purification station similar to the grill. Also similar to the grill, you must add planks to it to allow it to boil. You may have been able to ignore the shark for now, but you won't be able to forever. You should craft a wooden spear, which is a tool that allows you to attack the shark. However, you want to play defensively. If you jump in to the water to fight it, you will lose. It is a shark. You will lose. Don't try it. Wait for the shark to attack your raft, and then hit him with your spear. After four hits with the wooden spear, he will let go of the raft. You can also distract it by using shark bait, which will keep him in place for a while, useful if you want to do some underwater expeditions. You can craft a handy station in this game, the research station. Using it correctly will allow you to craft new things to develop your raft and character. When placed, you can walk up to it and interact with the book on it, which will open a menu showing all of your researchable things. You can get new researchable things by using blueprints, found in barrels. Place an item in the research spot and it will fill in the research requirement of that item for every researchable thing you have avaiable. All of them. Once you have met all of the requirements, you can click learn, and then from that point on you can craft the item. In this game you can craft nets, which will automatically pick up drifting materials, in case you missed them. Build as many as you can, they are very useful. This is a brief list of things I got stuck on, and how to get around them. Rope can be crafted with two leaves. Sand and clay can be found on the sea floor, and are mineable by using the hook on them (Hold it down, it will begin swinging, like a pickaxe). Giant clams are collectable by interacting with them. On your journey you will sail past islands and other rafts. You can use a paddle, or a sail, to head to them. For other rafts, try ramming into them and wedging your raft onto them as well as you can, as it will drift away. Collect the crate and then get back onto your raft. For islands, try sticking your raft somewhere where it won't drift away, get you can actually get onto the island. Make a mad dash for all of the things there, like flowers, new foodstuffs and coconut seeds. You can go underwater in this game, provided you know what you're doing. It is best to dive right next to the islands, as it is shallower there. Typically, if you're going underwater, you want to drop an anchor, throw some shark bait, and jump in. Grab all of the clams, seaweed, stone, sand and clay you can and swim back to the boat, as you can only distract the shark for a limited amount of time. You can get things which will improve your underwater experience, like fins and oxygen tanks, which are researchable items. How these two rather confusing things work. Sails work like a passive paddle, and push you in the direction they are facing, provided the sail is down. I do not believe adding more sails will improve their efficiency. Unfortunately, the only way I have found to rotate the raft is to strategically crash your raft into islands and other floating rafts in an attempt to spin it.